Wear it alone or stack them together. 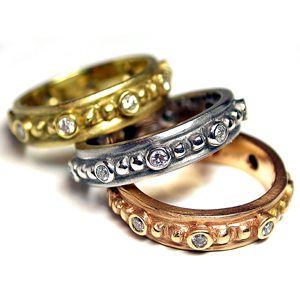 These original GNK design stack bands come in rose, yellow and white gold with 8 bezel-set round diamonds each. Brilliant-cut diamonds are F/G color, SI clarity and approximately .20 carat (each band). Fashionable matte finished bands come with high polished beads and bezels.